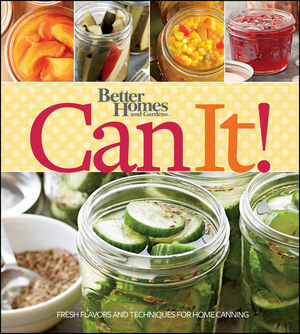 Don't Eat the Paste: Book Review- Better Homes and Gardens Can It! Now that it's getting time to start planting, it's also time to start planning canning projects. Can It! from Better Homes and Gardens is a book full of boiling water canning recipes with a few freezer recipes. No pressure canner recipes in the book at all. If you don't know anything about canning, and it's something you're just starting to get interested in to take advantage of gardens or local farmer's markets, boiling water canning doesn't take expensive equipment. I do my canning in my biggest stock pot. The book is laid out well with good explanations for people who've never canned before. It explains the equipment you'll need, how to follow a recipe, and how to process in a hot water bath. There are also lots recipes that are easy to follow for experienced canners who want to go beyond their usual recipes. Savory recipes, sweet recipes and seasoning and combinations that will appeal to foodies. Fantastic photos, and a good index in the back of the book to find things fast. The chapters are separated by types of food. There are traditional recipes in here, like strawberry jam which is a staple for anyone starting to can, but where it shines are in recipes that appeal to people who are really interested in experimenting with flavors. Adults will enjoy Strawberry Margarita Jelly made with Triple Sec and tequila, and people who enjoy savory sweet will like the herb jelly recipe. There are a lot of recipes that will be in regular rotation here. My daughter really enjoys canning and is looking forward to making and canning the spicy roasted tomato pizza sauce. My son, who is wild for pickles of all sorts really likes the Asian Pickled Carrots. We plan our canning by what's seasonal as well as what is growing in our garden to take advantage of low prices on in season produce. Lots of types of vegetables and fruit are used in the recipes, so if you grow a great crop of beans, you have several options for canning them with different flavors. All the recipes are very safe, with acid added for low acid foods. I recommend keeping one jar out of anything you are canning for immediate consumption if your family is anything like mine. Canned food also makes a wonderful gift. Great variety of recipes, a lot of which can become the basis for meals in the winter, and well written instructions make this the kind of winner you expect from Better Homes and Gardens. It's a book I'll recommend to my friends who can. Published by Better Homes and Garden, An imprint of Wiley. You can get this book from Amazon using the affiliate link below.